Eaton C Series Type GHB 1-Pole molded case circuit breaker is rated at 45-Amps and 277/480-Volt AC/125-Volt DC. The interrupt rating of this circuit breaker is 14-Kilo-Amps at 277-Volt AC/125-Volt DC. It has a dimension of 1-Inch x 2.63-Inch x 4-Inch. 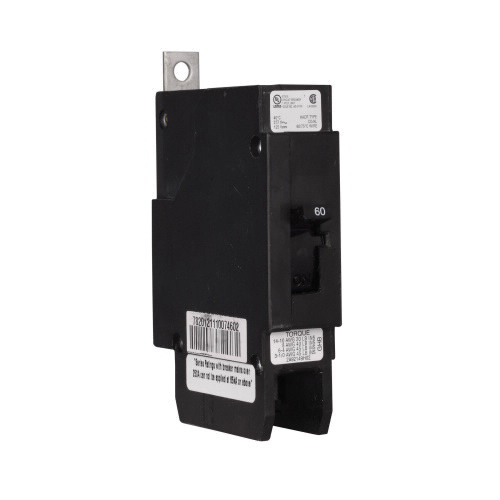 This 1-Phase circuit breaker with pressure type line and load terminal connection, accommodates aluminum/copper wires of size 10 - 1/0-AWG. It employs LI, non-interchangeable and thermal-magnetic trip of 15 - 100-Amp range for ensuring reliable performance. This G-Frame circuit breaker supports bolt-on mounting on panelboard, therefore making installation easier. It withstands a temperature rating of 40 deg C. Circuit breaker is UL listed, CSA certified, NEMA rated and meets Federal W-C-375B specifications and IEC/VDE standards.